An eye exam at Hadassah’s Department of Ophthalmology. A border policeman challenges a man acting suspiciously in Jerusalem’s Old City and is answered with a spray of metal projectiles in his face. A paintball pellet, flying at 280 feet per second, slams into the left eye of a 19-year-old from Atlanta, Ga., who had just enrolled in a pre-army program for the Israel Defense Forces. The eyeball of a 7-year-old girl bulges from its socket, forced out by the malignant tumor growing behind it. These three were among the many patients who came last year to the Hadassah-Hebrew University Medical Center’s busy Department of Ophthalmology. About 45,000 ophthalmology patients are seen annually by Hadassah doctors in one of the largest hospital departments in Israel. Their eye problems include infections and refractive errors that cause far- and nearsightedness, immature retinas in preterm babies and inherited genes that destroy sight. These eye conditions are part of the intense and challenging clinical work of a department that is also known for its teaching, research and global outreach. “Hadassah started out with eye care, and ophthalmology remains a special pride,” Ellen Hershkin, president of Hadassah, the Women’s Zionist Organization of America, told over 300 leading ophthalmologists from 17 countries at a scientific conference in Jerusalem in June that celebrated a century of Hadassah eye care. Hadassah’s ophthalmology department was the country’s first eye center, and it laid the foundations for Israel’s clinical and academic ophthalmic care. While the major challenge for its first ophthalmologists was infectious eye disease—overwhelmingly trachoma—their successors at the centennial conference shared advances in pediatric and neuro-ophthalmology, uveitis and cataracts, corneal and retinal disease, oculoplastic surgery and ocular oncology as well as pathology of and trauma to the eye. 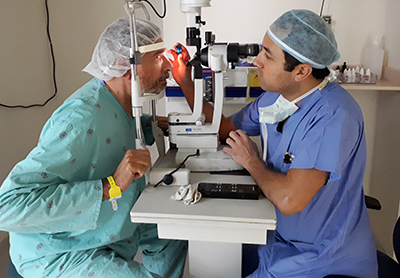 Dr. Itay Chowers leads the ophthalmology department’s 24-member faculty, one of the largest hospital departments in Israel. He will oversee its relocation into new and larger custom-built premises after the renovation and expansion of the iconic round building at the Hadassah Medical Center at Ein Kerem. The paintball pellet that hit the eye of 19-year-old Matan Rabinowitz fortunately missed his retina, lodging instead in the jelly-like substance in the eye’s interior. It took five stitches to close the rip, a week’s stay in the hospital in case of hemorrhage and then a “waiting game, checking the eye weekly to see whether the blood was absorbed, or whether further surgery would be needed,” recalled ophthalmologist Dr. Haim Levy. The paintball mishap came on the third day of the young man from Atlanta’s pre-army preparation, delaying Rabinowitz’s enlistment in the IDF. “I just hope I heal completely, so I can get into a combat unit,” he said. Eye diseases are another major departmental focus—and not all eye disease is about the eye, noted Dr. Chowers. Ocular problems can indicate joint disease or predict stroke; red eyes can be clues to systemic disease. Or, in the case of the 7-year-old Jerusalemite with the bulging eye, it can signal cancer. Hadassah ophthalmologists saved the young girl’s sight—and life—by teaming up with medical center radiologists and oncologists. They administered chemotherapy and high-dose radiation, delivering the latter with pinpoint precision to avoid harming healthy tissue. With the tumor obliterated, the undamaged eye was eased back into its socket. In another case, an otherwise healthy woman of 67 had a growing blind spot at the center of her vision, making her one of 170 million people worldwide, according to the National Institutes of Health, with age-related macular degeneration (AMD). While diagnosing her was simple, helping her was not. There had been no effective treatment for her form of the disorder, called dry AMD. This patient, however, may be among the first in the world to have her AMD halted and, perhaps, cured. Dr. Eyal Banin, director of Hadassah’s Center for Retinal and Macular Degeneration, has been leading a 15-year research effort to restore sight in patients with dry AMD. With his team, he has created retinal cells from human embryonic stem cells. Transplanted into the eyes of this patient and eight others two years ago, they have “improved their visual acuity, maintaining that improvement to this day,” said Dr. Banin. If stem cell therapy holds hope for degenerative retinal disease, gene therapy may have answers for inherited retinal disorders. Hadassah researchers have assembled a pool of 1,700 families with congenital retinal disease and identified among them a mutant gene responsible for the severe form of vision loss known as achromatopsia. “It normally occurs in one in 30,000 people,” said Hadassah molecular geneticist Dr. Dror Sharon. “In our pool, it’s in one in 5,000.” The researchers got lucky: They found the same mutation in a herd of sheep in northern Israel and restored their retinal function by transplanting healthy genes. The researchers are now waiting for Health Ministry approval for clinical trials in human patients. 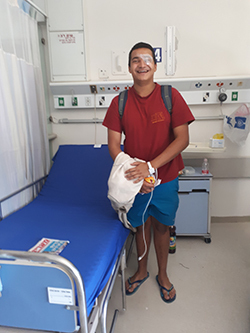 19-year-old Matan Rabinowitz visited Hadassah to check on his healing eye, injured by a paintball pellet. Shoumenn’s home is only a three-hour drive from Jerusalem—but he lives in Amman, so his treatment falls within Hadassah’s international outreach. 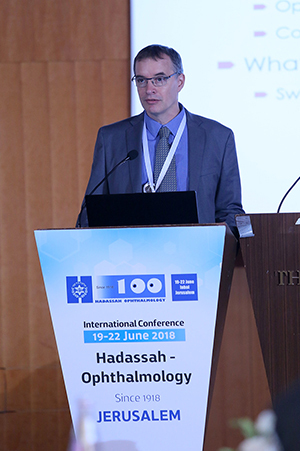 Hadassah’s advocacy and leadership in global eye health, evident from the multinational ties warmly on display at the conference, span a continuum and include six decades on the ground in developing countries—principally Africa—and 100 years working with its Arab neighbors. Most recently, in 2017, Hadassah joined with St. John’s Eye Hospital in East Jerusalem, the main provider of eye care for Palestinians and Israeli Arabs, to establish a genetic research unit to serve the Palestinian community. And Hadassah’s Dr. Mechoulam is training Palestinian physicians in Nablus to treat the eyes of preterm infants who suffer from retinopathy of prematurity, in which the immature retina detaches and the child becomes blind. Read about Hadassah’s history of ophthalmic outreach in How Hadassah Revolutionized Eye Care in Africa.